Clearwater Baths stunning range of Natural Stone freestanding baths just got bigger! The company has been busy fine-tuning and replacing models within the range based on their innovation and consumer preferences. The five new sleek models are all made from natural stone, which is sure to add luxury and elegance to any bathroom. The Natural Stone range has been a huge success for the company and adding five new models into the mix will give consumers even more choice when it comes to bathroom renovations. The natural stone used in these baths create a strong structure without the need for thick ledges or surrounds. The Clearwater Natural Stone bath range includes contemporary and traditional designs, that have been hand polished for over 10 hours each, providing a warm and tactile finish. Each Clearwater bath comes complete with a full 10 year guarantee and are built from one piece, meaning that there are no unsightly joints or seams to detract from the stylish designs. There is also a range of Natural Stone basins to complement the freestanding bath range. For more information on these baths or any other product on our website, you can talk to our talented sale team on 01765 694720. The bathroom is the room that can make a statement, it is always an area that is scrutinised by guests or house buyers so it is worth taking time to consider how it is best to revamp it without spending a fortune. Changing a tired bath is always a good idea, remember some of those trendy colours that were around in the seventies and eighties, if you still have one then reverting to good old fashioned white is best. Choose a footed rather than a built-in bath, as it creates extra floor space which, in turn, can make a small space seem larger. With the basin there are some classy countertop versions now available and they have the added advantage of having drawers and cupboards giving valuable storage space. You can complete this by hanging a pretty mirror above the basin, with lighting around it. Essentially a bathroom needs to be practical, comfortable and stylish and it has to be clean at all times, so avoid carpet. Bathroom carpet was fine in the days of massive houses and huge rooms, where carpet was for warmth, use wood, tiles or marble to keep the room clean and tiles are also a great way to add colour, pattern or texture. Lighting is a very important feature in a bathroom, subtle lighting from mirrors supplemented by down lighters is all that is needed, however it has to be adequate to be able to perform daily grooming. Modern bathroom cabinets with lighting a demister pads incorporated also have storage space for toiletries. You can fit a light in the bathroom that comes on automatically when you enter and turns off when you leave, so you don’t need to fumble around for the switch in the dark. There may be not a lot that can be done if the first thing that you see when opening the bathroom door is the loo, re-positioning this is a major operation involving re-routing the soil pipe so it is best avoided. It can however be made less stark by a floor standing decoration and it is a good idea to have a basket of loo rolls perhaps on a shelf behind it. Colours are of course personal, but it is best to stick to traditional styles if possible. The most typical colours for a bathroom are cream, white and black; the combination of black and white marble is a stunning arrangement. Marble tiles, glass and mirror are all good materials, and to give a bathroom a feeling of space a mirrored door is a sure way. Great lighting is key to creating a luxurious bathroom and the Imperial Toledo Single Wall Light & Glass Shade is perfect for that contemporary look. These glamourous lights are supplied with a chrome wall bracket and base, and features a curved opal glass shade ideal for adding ambiance to your bathroom. The Imperial Toledo Light also features concealed fixings for a professional look and comes with a 5 year guarantee. Towel rails are a great accessory to have in your bathroom, keeping your towels within easy reach just when you need them. The Never Drill Again Klaam Two Armed Towel Holder gives you space for two towels and comes in a high gloss chrome finish. What’s more, this towel holder features ‘Never Drill Again’ technology which allows you to permanently fix it to your wall without screws or drilling, but if you do ever want to move it, the adhesive won’t damage the wall it’s attached too, great! The humble toilet brush and holder is often neglected when updating a bathroom, but you can’t go wrong with the Inda Colorella Toilet Brush Holder. This sleek and modern accessory is wall mounted to keep it neatly out of the way and features concealed fixings for a clean look. Last on our must have bathroom accessory list is the Smedbo Loft Toilet Roll Holder with Lid. This stunning looking toilet roll holder is easy to clean and comes with a 10 year guarantee for peace of mind. Concealed fixings again create a professional look and the lid keeps your toilet roll from getting wet or damaged. For more bathroom inspiration and accessories visit our website. With over 260 years of inventiveness and foresight Villeroy & Boch have produced a diversified range of products in both the Tableware and Bathroom and Wellness divisions. Villeroy and Boch are at the forefront of design and technology and a range of their products can be found at the web pages of premier bathroom supplier UK Bathrooms. The company over the years has developed an enviable range of high quality ceramic products including the renowned single source bathroom. We illustrate here our suggestions for designing a beautiful contemporary bathroom using these contemporary products. Let us begin with the bathtub and we choose the Villeroy & Boch Oberon Oval Bath which is guaranteed to ensure a comfortable soak. Offered by us in five different sizes ranging from 1600mm by 750mm, up to1900mm by 900mm, the last of these has the option of being double ended. All of the baths are available with feet, adjustable from 145mm to 180mm. We can also offer this as a whirlpool, contact us and we will be delighted to give further information about this additional upgrade. For the all-important WC we suggest that the Subway Wall Mounted Toilet Pan will fit the bill perfectly. By opting for a wall-mounted design approach you have not only space saving but a distinct illusion of the pan being suspended in mid-air! There are a number of options on offer with this WC, for example mounting frames of different sizes and fitted seats as required. Choose from a fitted standard seat, or a soft-close option for that final touch of quiet comfort. Continuing with the theme of wall hung units we recommend the O.Novo Curved Washbasin, this basin will provides a genuine touch of quality and displays a clean aesthetic in keeping with contemporary trends. Supplied in White Alpin as standard, this basin can be upgraded with the unique CeramicPlus treatment, scientifically demonstrated to repel staining to keep its gleam for longer. You would not want your bathroom to be without a mirror and the V&B More to See One Mirror fits design of the bathroom perfectly. Taking a bold, contemporary form, the More to See Mirror has a definite cosmopolitan look and feel, perfect for our contemporary bathroom. This mirror is frameless and adds a sense of depth and space to the bathroom. Complete with an LED lighting strip, this gives the right amount of lighting for personal grooming as well as adding a strong sense of ambience to the area. Although we are designing our bathroom around contemporary looking products, we felt that a shower head which looks like the V&B Cult 220mm Shower Head will fit into any bathroom; it delivers a flow rate of 12 litres per minute, this in either in chrome as standard, or with a matt white finish as a special order, presents a crisp and professional finish. No bathrooms whether contemporary or traditional is complete without storage space and we have chosen the Central Line Tall Cabinet. This modern unit is wall mounted and features 2 doors, 2 drawers and 3 shelves, with the body and doors available in white, black, walnut or Macassar decor colours. To just say that retro or early 20th century lookalike bathroom products are popular would be an understatement of massive proportions; they have taken off like few others. Masters of this look are Burlington that has a collection that we are delighted to illustrate on our web pages. Getting a traditional bathroom look is straight forward and the first item to consider would be the bath. The slipper bath was all the rage in the early days and this Burlington Harewood slipper bath is distinctive. With a wide range of feet for this bath you can create the look that suits you, classical, period or traditional, and each come in chrome, white or black. With a wide range of free standing or deck mounted taps, so you have a large amount of design flexibility, and the tap or overflow can be drilled to suit your particular desire. The Burlington Regal Edwardian Medium Round Basin and Washstand is a true classic and with the pairing of wall mounted basin with complementing chrome legs and towel rail, you will have a vintage touch to your bathroom. The basin can be provided with holes pre drilled to accommodate either traditional separate hot and cold taps, or with a more contemporary mono mixer if required. Again this is a 21st century wash basin with an Edwardian look that is sure to grace a traditional bathroom. With the slipper bath as well as the wash basin we have left the choice of which taps to use as a personal choice, we have a huge selection of these at our dedicated section of taps and mixers. One which would fit the slipper bath to perfection would be the Burlington Claremont Regent Deck Mounted Bath Filler. This is a true classic and again benefits from modern technology. We offer a choice of either a quarter turn or screw down for the taps and a flow straightener for low pressure systems and aerator for high pressure. With the Burlington range of bathroom products, you are only a few clicks away from creating a fine traditional bathroom. Perhaps nothing makes a bigger impression in a bathroom than tiles and here at UK Bathrooms we offer a range of tiles in ceramics, porcelain, and glass. We also offer water resistant panels that making covering large bathroom areas easy. Mere Reef Interlock Panelling 3 Tile Wall Panels can be used anywhere in the home to create a water resistant and realistic tiled effect. With the clever interlocking system, the need for grouting is eliminated and with the panels you can cover both walls as well as ceilings. Supplied in four attractive colours, the panels are easy to fit and are resistant to fading and easy to keep pristine by wiping with a damp cloth. If you have a bathroom that is antique or retro in appearance then the Imperial Antique Crackle Ceramic Capping Tiles will be perfect for your bathroom. Cleverly designed to mirror the turn of the century look and replicating perfectly the handmade appearance with their irregular edging, these capping tiles are available in six beautifully neutral colours including ivory shell, grey ecru, sage thistle, cream haze, white linen, and canvas wheat. Villeroy & Boch Bianco Nero Decor tiles add a touch of sophistication and flair to any bathroom and they do far more than keeping the bathroom watertight, they add class and style. With a mirror like effect the tiles are offer in a choice of either black or white gloss, you will be amazed at the 3D effect that these beautiful tiles give. The tiles can be used either indoors or out and are 60×60 in dimension. Tiles do give a lasting impression as well as being an important functional addition to the bathroom, kitchen, en-suite or shower. Simple little accessories can often have a huge impact on a bathroom, lights, shelves even the addition of a decorative splash back can suddenly make an otherwise very nice bathroom spring to life. We have a huge range of accessories in our web pages and we illustrate just four of these that can take your bathroom up to the next level. 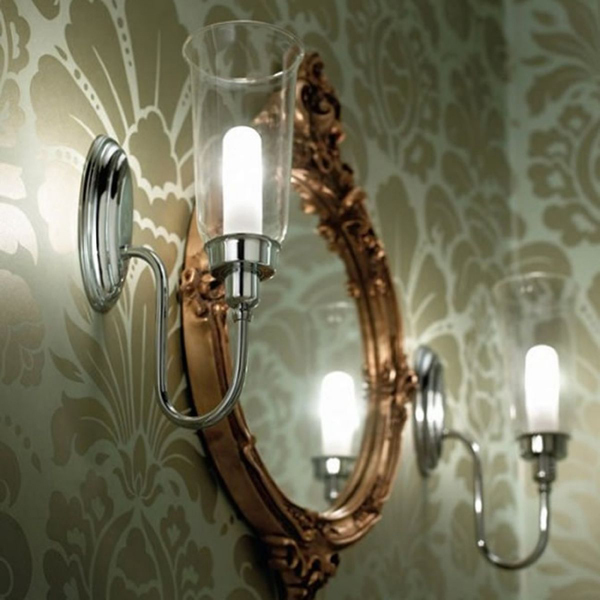 The Imperial Avila Wall Light with Glass Shade is a retro styled light that will fit into any style of bathroom. A classic and distinctively styled light with clear glass shades, the Avila is sure to be a big hit with family and friends. The light has concealed fittings which give a truly professional look and with give your bathroom a subtle and relaxing atmosphere, the light is guaranteed for five years by the manufacturer. Staying with the vintage look, why have plastic supermarket bottles of liquid soap when you can have the elegant Burlington Traditional Double Soap Dispenser certain to add elegance to your bathroom. The pump-controlled dispensers can be filled with any liquid soap or moisturiser with ease, eliminating the need for soap dishes or cakes of soap spoiling your basin. These are from the Burlington line of products; why not check out similar classy items. The one thing that can annoy even the most placid of us is lack of storage in the bathroom, but that is a problem that can be easily overcome by fitting a Bristan Gallery Glass Shelf. The shelf can be easily added to any bathroom, the shelf is square profile glass, surrounded by a rail to stop items form being accidentally knocked off. The Bristan is offered in either a chrome or gold finish and naturally has concealed fixings. All Bristan bathroom products have been created by skilled craftsmen and come with a five year manufacturer’s guarantee. Laying in a warm bath is sure to relax, but why not take it to the next level by adding The Kaldewei Soundwave Bath Sound System which turns the bath into a giant loudspeaker. By using the movement of the water, this replicates both the sound as well as the gentle rippling of the water. You can use the Kaldewei sound system with or without water in the bath water so even if you’re in the shower you can listen to your favourite songs at the touch of a button. The system is also compatible with your iPad, iPhone, laptop or any Bluetooth enabled device and can be paired with up to 8 devices at a time.